Igloo Products Corp., the nation’s largest cooler manufacturer, has introduced a new line of affordable – but still virtually indestructible - rotational molded coolers called Sportsman. With comparable or better features to the leading competitors and a lower price point, the Sportsman will be the best value on the market. With comparable or better features to the leading competitors and a lower price point, the Sportsman will be the best value on the market. Igloo Products Corp., the nation’s largest cooler manufacturer, has introduced a new line of affordable – but still virtually indestructible - rotational molded coolers called Sportsman. 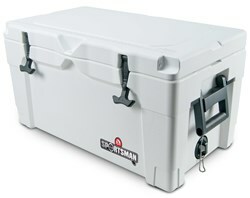 The Sportsman series serves as a complementary series of coolers to the premium Yukon Cold Lockers released in early 2012. According to Igloo hard-sides product manager, Lisa Silva, the Sportsman is a game-changer in the roto-molded cooler market. “With comparable or better features to the leading competitors and a lower price point, the Sportsman will be the best value on the market,” Silva explained. The line consists of two sizes—a 55-quart and a 20-quart. The 55-quart Sportsman will fit into most boat racks and under leaning posts that were designed to fit a 72-quart Igloo Marine footprint. The 20-quart is the ideal size for kayaking, sailing or other day trips. Each Sportsman comes with a minimum of two inches of foam insulation in the gasketed lid and 1.5-2 inches of foam in the body for extended cooling performance and has virtually indestructible rotational-molded construction with UV inhibitors and infrared technology. Like the Yukon, Sportsmans have a raised non-slip, textured working surface, fish ruler, Cool Riser Technology, and an oversized, tethered drain plug. They also feature durable, flexible rubber latches with finger grips, corrosion resistant aluminum hinges, and anti-skid feet. The lockable lid takes both short and long shank locks commonly found in the home. The 55-quart has comfort grip, no-sway handles that fold flat to save space, while the 20-quart comes with a “3-point grab” bail style handle with cushion-grip and two self-draining cup holders molded into the lid. The Sportsman 55 will make its debut in August 2013 and has an MSRP of $299.99. The 20-quart retails for $219.99 and will be available in the fall of 2013. For further information about the Sportsman line or about any other Igloo product, contact Katie Davis at KDavis(at)igloocorp(dot)com or visit the company’s Web site at http://www.igloocoolers.com.